Born between May 21 and June 20, Gemini is the third sign of the zodiac and sign of ideas and information. The sign of the twins is the first human sign and the sign of language. They are highly skilled communicators because words come naturally to them. Gemini are really energetic and love meeting new and interesting people. Navigate to the Gemini Traits you want to read first, using the navigation links below. 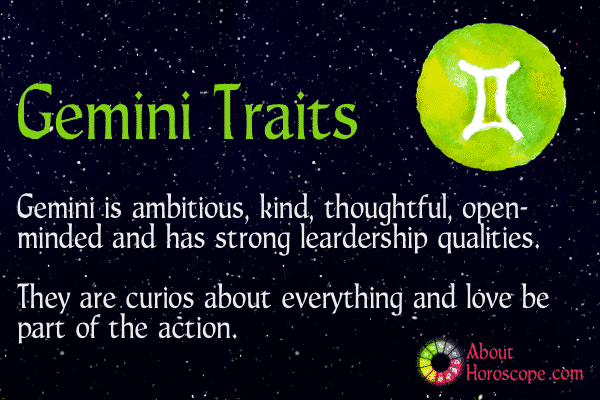 Gemini are very restless and constantly want to be doing something. They get bored easily because they long for mental stimulation and variety. Just like the other Air signs, they are friendly, sociable, and outgoing. Things are never boring when a Gemini is on the scene. Likes: Music, magazines, books, music, blogs, chats with nearly anyone, short trips around town. Dislikes: Repetition and routine, being alone, being confined. Are you a proud Gemini? Share the below infographic with your friends on social media. The Gemini zodiac symbol stands for those who thrive on new experiences, and never stop asking questions. They are charming and entertaining. The most known Gemini trait is duality, symbolized by the twins. One side shows the outgoing, flirtatious, communicative and caring Gemini. The other side presents the contemplative, serious, restless, and fickle Gemini. They can switch from being the life of a party to the wall flower in an instant earning them conflicting impressions. Versatility is a great keyword for this dual sign. Since the Gemini presents two distinctive sides to his or her personality, you can never be sure with which one you’re going to come face-to-face. Gemini man can impress you with his innate wit and charm. He can talk for hours, and certainly you will not get bored in his company. He can be an excellent communicator if masters this skill. He is highly interested in knowing what’s happening around and pays attention to the latest news and current events. The Gemini man is a jack of all trades, his intelligent mind springing from project to project, and whizzing from one hobby to the next in a short span of time. As the attention span is very limited, Gemini men may not be very good at doing in-depth analysis and focusing on minute details. He will have many interests, for example; gardening, reading, rocket science, telepathy, ancient history. Curiosity at high level, everything fascinates him. He loves problem solving and approaches challenges like a game, applying his cool reasoning to get out of risky situations. Gemini Men are the firm believers of “Live and Let Live Philosophy”, and so they will shield their private space as they don’t like any kind of intrusion, and see to it that their freedom is respected. When they find out that somebody is trying to put them in a confined space or try to attack their freedom in any way, they will immediately run away! In social circles, Gemini men are stunningly popular ones, and what contributes a lot to their popularity is their creativity. Gemini men are imaginative and can think out of the box and come up with practical and innovative solutions or recommendations. This may become a major block in their path when they want to reach great heights in life. No one typifies the Gemini man that multi-faceted American actor Johnny Depp. Perhaps best known for his portrayal and interpretation of unique characters, Depp has made a career of creating some of the most iconic, beloved and memorable figures in Hollywood. Among these include Edward Scissorhands, Ichabod Crane, Willy Wonka and of course the charming Captain Jack Sparrow from the highly-successful “Pirates of the Carribean” franchise. Collectively, Depp’s movies have earned US$3.1 Billion worldwide. Depp is also an accomplished musician/guitarist who has performed alongside popular recording artists such as Paul McCartney, Oasis, Tom Petty and the Heartbreakers and Joe Perry of Aerosmith. In addition to his achievements in movies and music, Depp is also a wine-maker and restaurateur in France; the city he chose to reside with his family to avoid the trappings of fame in Hollywood. The strength of the Gemini woman lies in her vibrant personality and optimism. She is extremely clever and has the ability to talk about any topic under the sun –fashion, politics, religion or entertainment. She is constantly curious, prodding and poking at every angle and idea, her active mind flitting from one thought to the other faster than lightning. She is witty, quick with one-liners, and will remember the tiniest, most obscure trivia. She loves to talk, but as a means to discuss, to gather ideas and information, not simply to fill empty spaces of silence. She is a multi-tasker and can shuffle different interests and hobbies. On the flip side, they get disinterested quite easily and may divert from their original track. She can easily get along with everyone, as they are excellent at conversation and open-minded. She loves to be surrounded by people and be active. It’s no surprise that she is an excellent party host and organizer. She loves to travel a lot as it offers them with an exciting opportunity to go to various places, meet people from all walks of life, and in the process gain some valuable experiences. She is an undeniably fair human being; a good advisor, and an excellent diplomat. The combination of high intelligence, eloquence, wit and charm serves the Gemini woman well. Strength in character, a vibrant personality, optimism and well-versed in several topics could best describe perhaps one of the most celebrated Gemini women, Angelina Jolie. While Jolie has won recognition in her acting career including an Oscar for Best Supporting Role in 1999’s “Girl Interrupted” and her movies have earned US$3.1 Billion worldwide, is it her work as a humanitarian that has captured the hearts and imagination of people the world over. Jolie advocates several causes including conservation, education and human rights. In 2001, she was named UNHCR Ambassador and regularly makes trips to war-torn and poverty stricken areas to raise awareness, generate contributions and financial aid. Despite Gemini’s powerful ambition, work isn’t their strong point. Ever the willing learner; Gemini are frequently characterized by potential energy rather than actualized accomplishment. They rely on inspiration, and often discover that their friends and followers respect their opinions more than their actual work. Though easily distracted, Gemini can be excellent in the work force. If the job is interesting and appealing, the Gemini will get more done before lunch than his co-workers will accomplish all week. If the task at hand seems mundane and boring, he will procrastinate for a short time before moving on to a more challenging career. Gemini personalities love to be informed about all that is going on at the work place; they will look to their co-workers for input and advice. In spite of their insistence on being in the limelight, Gemini are great team players. No matter which career field a Gemini chooses, it’s essential that the job be one that keeps him busy, engaged, and provides opportunities to communicate. Gemini tend to be skilled at working with their hands, but they are not well suited for repetitive tasks. Geminis gravitate towards work that is scholarly in nature, research, discovery, or teaching. For Gemini, careers that provide opportunities to come up with fresh ideas and innovations are an ideal choice. Excellent career choices for those who exhibit typical Gemini traits include: Actor, lawyer, journalist, events planner, politician, public relations, sales agent, teacher, architect and writer. Gemini is an air sign – free-spirited, idea-oriented, and social. As such, Gemini natives are looking for partners that satisfy their need for intellectual stimulation, good conversation, and constant variety. They are best suited to matches with either their fellow air signs or complimentary fire signs. Love with a Gemini can be challenging and frustrating, but positively rewarding. Gemini’s dual nature means that the Twins get bored easily. They are prone to fickleness and flakiness which can sometimes make forming deep, lasting relationships a problem if they don’t make a point of working at it. They also have a predisposition toward inconsistency, nervousness, and short attention span.To find and keep love, Geminis must find a sign that is up for the challenge and who won’t try to tie the Twins down. Love and commitment with a Gemini may take time and a lot of effort to develop, but will result in an adventuresome, passionate relationship that’s well worth the wait.When it comes to romance compatibility astrology, Gemini meshes best with fellow air signs, as well as energetic fire signs that share their vitality and zest for life. Because of Gemini’s need for constant stimulation – mentally, physically and emotionally – the Twins are most compatible with signs that will provide Gemini plenty of freedom and excitement. With the Twins, there’s only one guarantee – there will never be a dull moment. The best love matches for Gemini include Aries, another Gemini, Leo, Libra, Sagittarius and Aquarius. 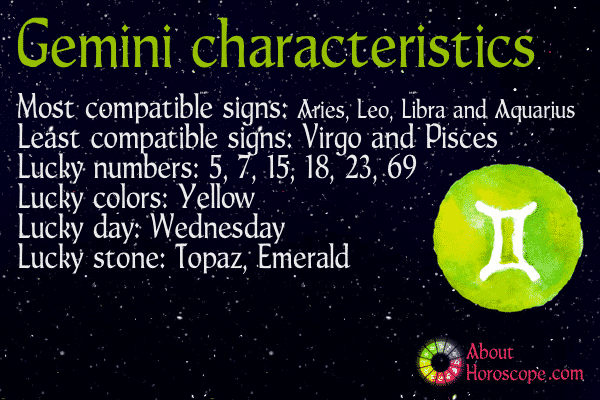 Do you want to learn more about Gemini’s compatibility with other zodiac signs? We got all signs covered. Use the menu below to discover if you are compatible with your loved one. The sign of Gemini rules the shoulders, arms, hands, and lungs. Many natives of this sign are noted for their graceful arms and beautifully shaped hands. They are dexterous, well-coordinated, and often excel at sports and dancing. Gemini’s are vulnerable to upper respiratory infections, bronchitis, and asthma. Gemini also rules the nerves, it’s no surprise that they are often excitable and high-strung. The planet Mercury, which rules Gemini, has always been associated with respiration, the brain, and the entire nervous system. It also governs the delicate links between the mind and the different parts of the body, Geminis’ mental state has a great deal to do with their health. Anxiety and nervousness literally can make them sick. Relaxation is essential to their well-being. They should take time to unwind, relax, and unknot those nerves. Coffee and stimulants make matters worse and should be avoided. Herbal teas have a calming effect. Gemini people are inclined to eat on the run and are notorious junk food addicts. Proper diet and eating four mini-meals a day can be beneficial to their health. The lucky number for Gemini is five which represents sensuality and symbolizes freedom, variety, adventure and the senses.The lucky color for Gemini is yellow which is the color associated with Mercury. By tradition, it is thought to have a happy effect on its wearer, as well as stimulating the intellect and bringing vitality. It is also believed to signify the color of money rather than of love and is believed to be a favored color to wear when beginning a new job.